The new release of 4 ply Techniice stays frozen longer than ever before! Techniice reusable dry ice packs / gel packs 4ply comprises of 2 non-woven textile layers, which encapsulate a specially formulated cross-linked polyacrylate polyalcohol co-polymer refrigerant combined with a post treated trade secret formula. A remarkable leap forward in ice pack technology utilising a cross-linked polyacrylate polymer that can be frozen right down to minus 190C (that's more than twice as cold as dry ice! ).Techniice reusable dry ice packs / gel packs is often frozen in blast freezers to minus 80C when used in dry ice applications. New Techni Ice reusable dry ice packs / gel packs HDR model can be used very successfully even when frozen in domestic household freezers. Techni Ice reusable dry ice packs / gel packs will freeze between minus 18C and minus 21C when the freezer is adjusted to the maximum setting. If you have a vertical domestic freezer with at least 2 or 3 refrigerated shelves and you fill the freezer completely with Techni Ice reusable dry ice packs / gel packs, then Techni Ice reusable dry ice packs / gel packs will often double the freezer temperature within 1 week to up to minus 35C. Many customers are now using cheaper domestic freezers with Techni Ice reusable dry ice packs / gel packs to obtain commercial freezer results. Factory certification of ISO-9002 ensures that our Techniice reusable dry ice packs / gel packs product is manufactured to the highest international standards. 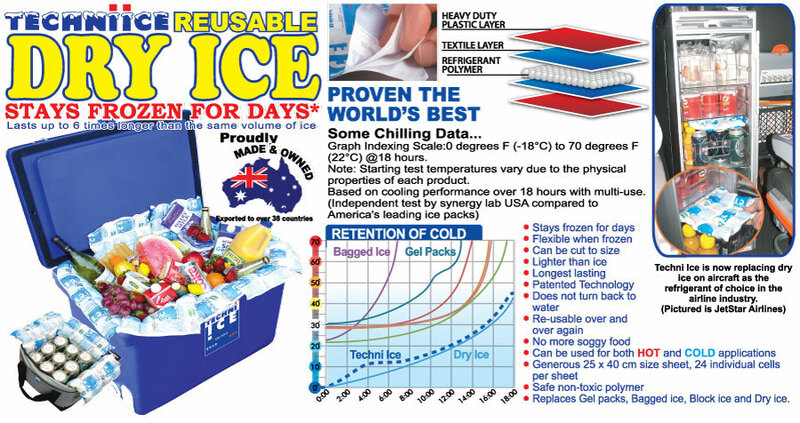 Techniice reusable dry ice packs / gel packs are a certified food safe product manufactured in Australia, using cutting edge technology machinery and processes that are currently the most advanced in the world. Techniice reusable dry ice packs / gel packs comprise two outer layers of sandwich printed PET/LDPE blended laminate, which gives the product its printability and heat sealability.